A knot is a method used to fasten or secure linear material by looping or tying a rope upon itself or to another rope or to another object or thing. A knot can comprise of a length one or several sections or pieces of rope, string, webbing, twine, chain, strap etc. Knots have been the subject of interest for many people as they are keen to know about the origins and usefulness of these knots on daily lives. Knots also have some role to play in mathematics in form of ‘knot theory’. 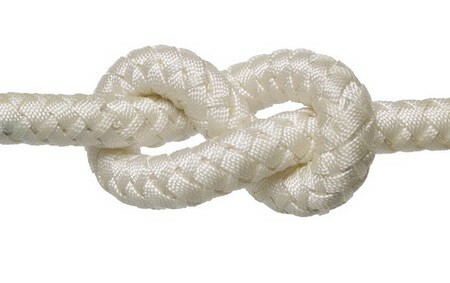 There are numerous varieties of knots which are used to perform several different tasks. Knots become handy in so many ways, especially when you need to bind the two ropes with each other or to bind the rope with any object or thing like cleat, ring, stake etc. Knots also become handy where you need to bind or compressed the objects. There are decorative knots which are tied to their selves in order to get some eye-catching decorative design. It is always vital to select the right kind of knot for right kind of job or task. You must need to develop this skill of choosing a right knot for the right task and for this you need to have some knowledge about the different types of knots. Following are given some of the different types of knots. One of the oldest and more reliable type of knot that becomes handy when a fixed loop is required at the end of the rope. Bowline knot is popular because you can easily tie and untie it. Apart from being so useful and dependable knot, it has some drawbacks as well for it can become loose when not operating under a load and often the bight portion of the knot overturns. Reef knot is another old type of knot used where simple tying is needed make the rope or line around an object safe. Mostly, reef knot is used to tie two ropes mutually but this is not suggestible because of the shaky nature of the knot. The simplest rule of thumb to form this knot is ‘right over left and left over right’. 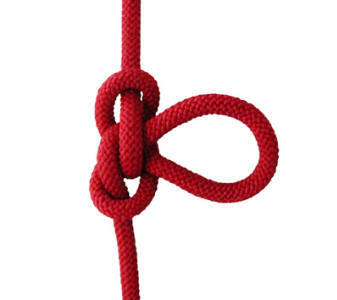 This knot is formed by binding the left-handed overhand knot and then a right-handed overhand knot, or the reverse. Becket bend, weaver’s knot and weaver’s hitch are some of the other names for sheet bend. Sheet bend is a kind of knot which is used to tie two ropes together. If double sheet bend is used, it will give you a reliable tying lines having variable diameter or strictness. Like bowline, it is inclined to get loose when not operated under load. Tape knot, ring bend, grass knot and overhand follow through are some of the other names used for water knot. Water knot is a kind of knot which is widely used for climbing by binding two ends of the webbing together such as a sling. Water knot is formed by tying overhand knot at one end preceded by the other end providing it in the opposite path. Buntline hitch is a kind of knot used to join a rope to an object. Buntline hitch is considered as a secure and reliable knot which is formed by looping the rope around the object. After looping the rope around the object, you need to make clove hitch around the rope’s upright part. Make sure that the two half hitches create the clove hitch are in the direction of the object instead of facing away. 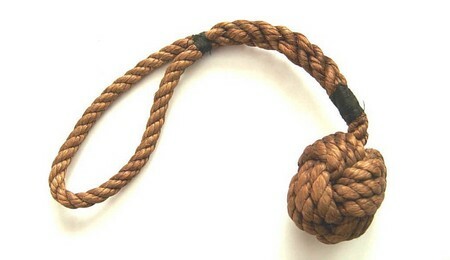 The name may have given you some idea about this knot which is used to tie the rope to a log of wood. This knot is easy to tie as well as untie. In order to form a timber hitch, first pass the rope around the piece of wood, then round the upright end of the rope. Next you need to wrap the rope around the loop three times and fasten the knot so as to make sure that the three turns grip the piece of wood tightly. Rolling hitch also known as Magnus hitch is a kind of knot which is used to join the rope to a rod, pole or to another rope. It is considered as a simple friction hitch designed for lengthwise pull along instead of at right angles. The main purpose of rolling hitch is to withstand the lengthwise motion. Taut-line hitch and rolling hitch are almost the same. However, taut-line hitch is known to be an adjustable loop knot which is used for the lines having tension. Taut-line hatch is extremely helpful in conditions where the length of a line require to be adjusted every so often to sustain the tension. A taut-line hitch is formed by binding the rolling hitch around the standing end of the rope. The tension is adjusted by sliding the hitch to a required length without being rebinding the knot. Trucker’s hitch is a kind of compound or self-binding knot widely used to tie or secure loads or objects on trucks or trailers. Trucker’s hitch is a knot that is formed by loops and turns in the rope itself. It is known by many different names and often used to sustain the tension in lines. Geoffrey Budworth is of the view that this sort of knot developed in the old days when horse drawn transportation was used by carters and hawkers to transport goods from one place to another. It is a kind of knot which is known to be the most helpful binding knot. Although, it is simple to tie, it is pretty hard to untie this knot once it is fastened. It is formed in a similar way as clove hitch, but the difference lies in a point where one end of the rope crossed under the other, hence creating an overhand knot under a riding turn. The double knot is much stronger with two riding turns. Alpine butterfly knot is a kind of knot which is used to make a firm loop in the middle of the rope. This sort of knot is formed in such a way that it bind in the bight without even accessing either of the ends. This sort of arrangement is extremely good when you are operating with a long climbing rope. This mid-line rigging knot is well proportioned and can be used for variety of tasks. For instance, if we talk about climbing rope, it can be used for traverse lines, anchors, restricting rope slings and so on. It is a kind of friction hitch or knot that is utilized to place a loop of cord around the rope which can become handy in climbing, canyoneering, mountaineering, caving, rope rescue, and for arborists. The word Prusik is applied to both loops of cord and the hitch. In long term, this term can also be applied to any kind of friction hitch or device that is capable of grabbing a rope. The term Prusik is often misspelled by the people who confused it with prussic acid and spell it as Prussik or Prussick. Figure-eight knot is a knot that has its implementation both in sailing and rock climbing where this knot helps to retain the ropes from slipping out of retaining devices. One of the main features of this knot is that it can be untied easily even after it is firmly tightened. Spanish bowline is in fact a kind of double loop knot used to lift up a person. There is a distinction for conscious and unconscious persons. In case of conscious person, each of the two loops is put around each leg and the person holds the straight part of the rope. It seems as if this knot behaves like a makeshift Bosun’s chair. However, in case of unconscious person, one loop is put around the arm pits and the other is put around the knees of the person. It is a bit difficult to tie this knot for a person who is new to it, but once you are mastered to it, you can tie it quickly. One other example of double loop knot is that is a fireman’s chair knot. However, this is not as good as Spanish bowline. A monkey’s fist or a monkey’s paw is a kind of knot that resembles a small tightly closed fist or paw. This knot also resembles volleyball or an old-styled football in appearance. This knot was previously used as an anchor in rock climbing but is now outdated and risky as well. 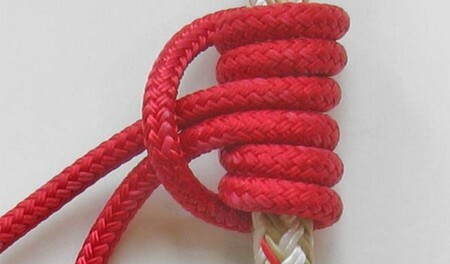 This knot is normally bound at the end of the rope so as to serve as a weight. 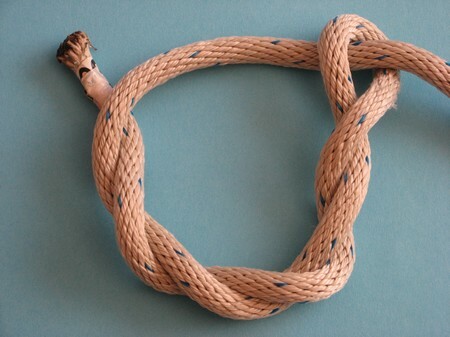 This arrangement of knot makes it suitable for use as an extemporized weapon for sailors such as slungshot. It is a kind of knot comprised of two loops having rope crossed backward and forward between them. In its functions, it works pretty much like a Trucker’s hitch with slight differences. Above mentioned are some of the different types of knots. It is always handy to have a good knowledge about some of the different types of knots because in our routine lives we come across several tasks where we need to tie a knot of particular type depending upon the job. Not all the knots work well in all situations so it is required to use certain knot according to the job rather than putting yourself in awkward or terrible situation.